Ni's Papercrafting Place! : Creativtiy Club DT Tuesday - Love but not love! Well the original post I had planned for today has completely gone out of the window as I HAD to make a new card to share the fabulous new weekly downloads from the Creativtiy Club with you! There are 2 collections this week, Love in Pink and Love in Red, featuring heart images and lovely text backing papers as well as more generic patterns and those patterns are what I have used to make this bright funky card today. I have printed the stripe and zig zag papers from the Love in Pink download and then cut them down into strips and mounted them onto a card blank covered with a burgundy textured card. The swirls are cut from one of the xcut border die sets, the happy birthday sentiment is from the Bookprint travel stamp set mounted on to one of the dies from the Speech Bubble set and the 40 was a blue cardstock sticker but is now red after being coloured with a zig alcohol marker! I hope you like this bright card, its is perfect for the bubbly lively recipient and although it is a love download, not a heart in sight! I can not believe that it has been 6 months already since the first Creativity Club design team was announced for their 6 month term and now it is time for a new team! 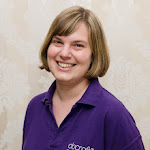 I have offered to give up my space on the team in order for a new crafter to join and showcase their talents with you; but you are not rid of me yet, as a demonstrator I may be popping up on the Docrafts blog in the near future!